Kylemore Abbey sits proudly on the western coast of Central Ireland. Make your way to County Galway in Connacht Province. It is there, overlooking the water, that you'll come across this lovely structure. To get to the abbey and its walled Victorian gardens from Dublin Airport, the journey by car can take over three hours. The drive is due west on the M4 and the M6 until you reach Galway, and then N59 bring you right to Connemara and the abbey itself. 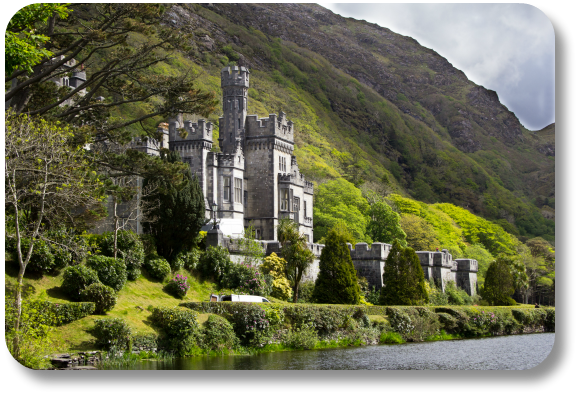 One of the newer castle-like structures on this list is Kylemore Abbey, which was originally built as Kylemore Castle near the end of the 19th century. While the castle began as the private residence of Mitchell Henry, it was eventually purchased in 1920 by Benedictine nuns who had escape from Belgium in World War I. The castle in County Galway still serves as a private abbey for the nuns, but the walled Victorian gardens surrounding the abbey are open to the public and make for an incredible picnic site on a sunny afternoon. The castle was designed by James Franklin Fuller. Fuller was an Irish architect who built a number of private homes as well as religious buildings. Kylemore took four years to build. During that time, there were more than 100 men working full time to complete construction. Once complete, this enormous castle occupied more than 40,000 square feet. It boasts 70 rooms and walls that are a staggering three feet thick. In 1909, the castle was sold to the Duke and Duchess of Manchester. Gambling debts, however, ultimately led them to sell the castle just 11 years later to a group of Benedictine nuns. Today, Kylemore is known as an abbey rather than a castle. It is still used by Benedictine nuns. Kylemore was also a school for girls. The Catholic school was for day students as well as boarding students from around the world. Since the 1970s, the walled gardens at Kylemore Abbey have been open to the public. If you get the chance to visit, take the time to walk amongst the six acres of gardens and admire the flowers, greenhouses and vegetable gardens. On a guided tour, you can see many of the rooms within the Abbey. You'll walk through the entrance hall, the drawing room, the saloon hall and even the large dining room. If you're a nature lover or a photography buff, one of the best ways to experience Kylemore is through the guided hikes above the abbey. These hiking tours are run a few times a week in the summer, and they offer extraordinary views.